Thanks for making this happen ! Either this takes a life of its own (and I have high hopes it will) or it will slowly die. Either way, it'll be worth listening to your favorite classics. 20 songs, no rules - you picked what you wanted. Nominations will follow the same rules as the weekly "new" chart. You can vote for 10 songs. Nominations are taking place during the voting process but may be closed before the vote finishes. However, the weekly frequency may be a tad too much - so I won't put a time limit to voting...yet. Let's see if the forumers subscribe to the idea. Without further delay, here are the nominations for this week. Very eclectic, classic and indie rock rather well represented. One trance track, for once no rap/hip-hop yet (Bootsy, where are you ?) Oh. and one that cannot be categorised. As the chart progresses, popular tracks will move to the hall of fame, giving us a picture of the ultimate AMF Chart Playlist. That's the hope anyway. Last edited by spiritualized on Tue Feb 20, 2018 9:11 am, edited 2 times in total. Henrik, if I am not mistaken, your nomination was heavily sampled by West Coast hip hop artists, wasn't it ? I'm thinking Snoop Doggy Dogg or Ice Cube ? spiritualized wrote: Henrik, if I am not mistaken, your nomination was heavily sampled by West Coast hip hop artists, wasn't it ? I'm thinking Snoop Doggy Dogg or Ice Cube ? Maybe I should use this game to pick relatively unknown but awesome sampled songs? So I’ve never voted in one of these before - is it possible to change my vote after I’ve already voted (or at the very least, add to it)? I like this concept Spiritualized! Nice job! I know it must be a heckuva lot of work to manage both this and the "new" music chart but I'd like to see it limited to votes not to exceed one week. 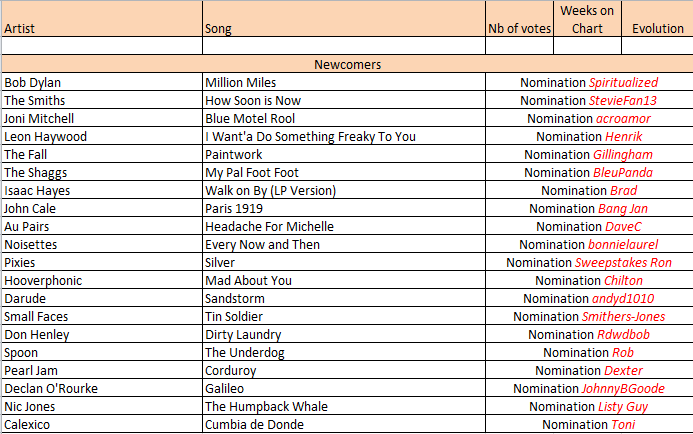 It appears that the interest here has sparked more voting on the "new" chart also. Way to go!! Got to say this is a great idea and I predict it will be as successful as the new music chart! You know I'm gonna be okay"
Blue Motel Room is misspelled. StevieFan13 wrote: Blue Motel Room is misspelled. Rdwdbob wrote: I like this concept Spiritualized! Nice job! I know it must be a heckuva lot of work to manage both this and the "new" music chart but I'd like to see it limited to votes not to exceed one week. It appears that the interest here has sparked more voting on the "new" chart also. Way to go!! You have until the 25/02 to submit your votes. Aw, no appreciation for the Baha Men? I can't think of a better song where the artist simulates dog noises. If there is, certainly no one here has talked much about it. To explain myself, I'm not meaning to troll as much as lighten the mood with joke song choices. If we're going with a concept as intense as us discussing 20 favorite songs each week, I think it's fun to shove in something with no actual chance of taking a winning spot - and I've always enjoyed so bad it's good stuff. And maybe we need a reminder of the true horrors of bad music. I like a lot of novelty songs, but even I have my limits . BleuPanda wrote: To explain myself, I'm not meaning to troll as much as lighten the mood with joke song choices. If we're going with a concept as intense as us discussing 20 favorite songs each week, I think it's fun to shove in something with no actual chance of taking a winning spot - and I've always enjoyed so bad it's good stuff. And maybe we need a reminder of the true horrors of bad music. Sounds like an excellent idea for a new all-time list: Greatest Bad Songs of All Time. Ahhh all becomes clear now. Somehow "troll" and "BleuPanda" did not seem to come from the same dictionary, so I am somewhat relieved as I thought you didn't appreciate the concept. As a matter of fact, I think you are right - if contained, the idea is great. A bit of fun in this heavy enterprise of a chart is welcomed. And, as a sidenote, I am more than pleased with the uptake...153 votes is resounding support for the chart. Fortunately, no need to comment on all 20 songs, and only 10 max will join the fold next week. My only concern is about ties. We're heading into a 3 way tie @ 7 votes for the last places, I think some nominations may have to be cut next week ! Keep this one under warm covers, it looks like we have enough nominations for next week. And for you all voters, it looks like we have a three-way tie for 10th place @ 8 votes for the Noisettes / Pearl Jam / Calexico. Who is going to end this one ? a couple of days before the end of the vote.